What world do we want to create? What might be possible? 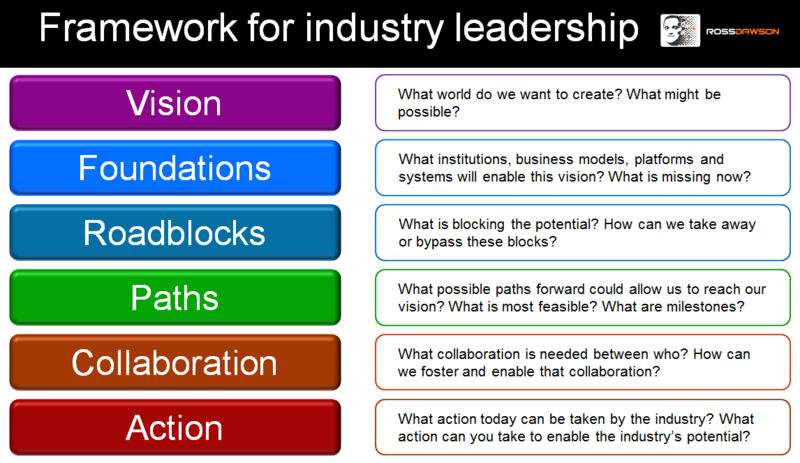 What institutions, business models, platforms and systems will enable this vision? What is missing now? What is blocking the potential? How can we take away or bypass these blocks? What possible paths forward could allow us to reach our vision? What is most feasible? What are milestones along the way? What collaboration is needed between whom? How can we foster and enable that collaboration? What action today can be taken by the industry? 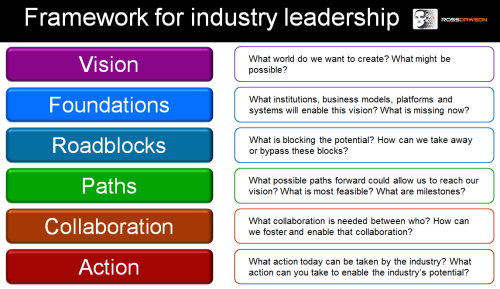 What action can you take to enable the industry’s potential? This framework, or variations on it, can be applied in any industry. Every industry requires leadership to change from where it has been to where it can create substantially greater economic value for its participants, and social value for all stakeholders. Some may wonder why they should invest their energy in leading their industry forward rather than focusing solely on their organization, however leading beyond boundaries always brings value to those who help move the system forward. Today, you must be a leader across a domain that often extends far beyond the borders of your company. In order for your company to succeed, the whole value network within which you work must succeed as well. Unless you provide the leadership for that to happen, you become the subject of industry forces rather than creating them. Industries will inevitably shift dramatically as the network economy comes to life, and those that will take best advantage of those changes are those that lead them. In every industry, the opportunity is there.